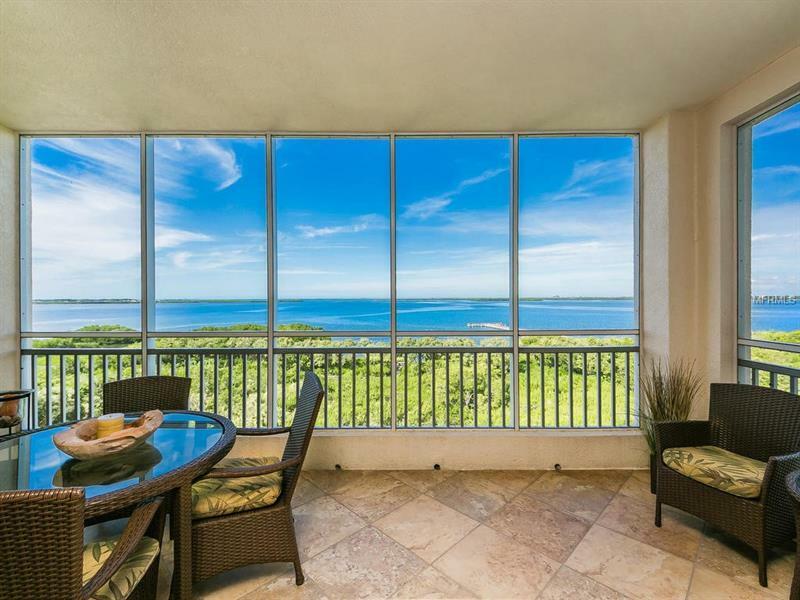 Indulge in spectacular unobstructed views of Terra Ceia and Tampa Bays all the way to the Skyway Bridge. This incredible Bayfront residence will give you front row seats to some of the most amazing natural coastline found on the Gulf Coast. The condo itself is immaculate featuring over 2400 sqft a luxurious master suite with dual walk-in closets large viewing windows and a lavish en-suite bathroom two additional guest bedrooms and a den/office/or even 4th bedroom. The large gourmet kitchen includes solid wood cabinets granite counters matching stainless GE Profile appliances and a breakfast bar providing open views of the bay. The lofty ceilings and open floor plan provide ample space for a large family or entertaining. Add tile and wood flooring throughout modern ceiling fans custom lighting crown molding plantation shutters impact windows 2 parking spaces in-unit laundry room and a large screened balcony overlooking the coastline to the horizonâ¦ what more could you ask for? Bay Club Condominiums are part of the Palms of Terra Ceia Bay gated community and both offer a lengthy list of amenities from a 500â fishing pier nature trails 18 holes of pristine golf with an on-site pro shop clubhouse pools spas tennis biking fire pits outdoor grills restaurant tiki bar and more. And donât forget that itâs perfectly located between St. Petersburg and Sarasota so you are only minutes away from a multitude of dining shopping and entertainment experiences. Pet Restrictions: Max of 2 pets per condo with a max combined weight of 60 lbs. Please see HOA or Condo Docs for Pet Information.